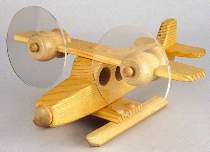 This great kids toy is made from a piece of 2x4 and some scraps of 1/4" stock. The clear plastic propellers give the look of spinning propellers. All patterns drawn FULL SIZE. Measures 10"L. Order hardware separately or see Special below. Sea Plane Hardware includes two clear plastic propellers, two candle cups, ten axle pegs, a 3/4" screw hole plug and wood dowels. Project plan, wood and wood finish are not included. #8028 Special includes the plan and hardware enough to make one sea plane.